In 2016, the incumbent Presidents of the EANM and the UEMS/EBNM initiated a project to develop a comprehensive, yet concise, nuclear medicine practice guide. Only two years later, in October 2018, this ultimate hand book from and for the Nuclear Medicine Community was launched. The European Nuclear Medicine guide is a joint publication by the EANM and Nuclear Medicine Section of the European Union of Medical Specialists (UEMS/EBNM). The European UEMS/EBNM Training Requirements for the Specialty of Nuclear Medicine (updated in April 2017) serve as the backbone of this document, ensuring its high relevance. Because we truly believe in sharing: the access to this European Nuclear Medicine Guide is free, for everyone, without limitations. We promise. To fit to your personal needs, the Guide is available as browser-based online version and as app for your smart phone or tablet (iOs and Android). The most convenient way of browsing the content of the European Nuclear Medicine Guide on a larger screen, like on your computer, is the free online version. 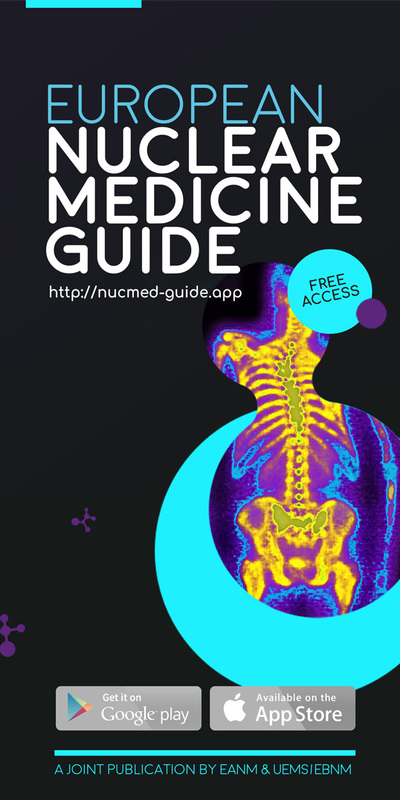 Practical, easy-to-use, and once downloaded also readily available even without WIFI-connection: make sure to download the European Nuclear Medicine Guide App to your mobile device: all knowledge available in your pocket, anytime and anywhere you might need it. Download the app to your Android or iOS device directly from the App stores – for free!